Nuts, trail mix, energy bars? They do the trick. But it doesn’t take long for regular snacks like those to become boring and bland. So I went on the search for something full of flavor, but healthy and compact. 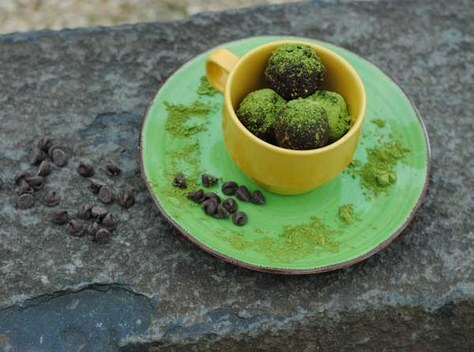 These chocolate matcha balls will give you both energy and a smile. Nuts, trail mix, energy bars? They do the trick. But it doesn’t take long for regular snacks like those to become boring and bland. So I went on the search for something full of flavor, but healthy and compact. And something that would sustain me too. That’s when I came across the powerful energy of matcha green tea powder and dates. You heard me right — dates are a great choice to get you going. They are rich in glucose and go straight to the liver for immediate energy. The body doesn’t have to convert it to a different form of fuel to utilize it. Matcha is a natural energy booster. Combined, this is the superhero of hiking snacks to keep in your bag. This treat not only keeps you going, but tastes great and keeps you full too. Chocolate, cinnamon, cardamom, and almonds finish off these balls with a powerful tasty punch. Matcha isn’t the easiest to find, but you can usually locate it at a natural food grocery store, like PCC or Whole Foods. For a more economic choice, head over to Trader Joe’s and get their matcha latté powder. It tastes great and gives you the same energy boost as the plain matcha powder. Combine the dates and almonds in a food processor until you can roll the dough into a sticky ball. Add the cocoa powder, matcha powder, spices, milk, and extract to the dough and pulse the food processor until combined. Once mixed, roll the dough into small 1’’ balls. Dust with matcha powder if desired. Store in fridge or freezer, pack along with you in the hills, or enjoy for a pre-work out snack! You’ll need a food processor or a very powerful blender to make these. But you can make them in 10 minutes — tops. Keep them in the fridge up to two weeks, or the freezer for longer. Not only will you mix up your snacking routine on the trail, your body will thank you for the extra energy and delicious change of pace. This article originally appeared in our May/June 2015 issue of Mountaineer magazine. To view the original article in magazine form and read more stories from our publication, click here. Thanks! I'm going to try these. I prefer to use whole milk over almond milk. I'm wondering if these will spoil in my pack on a long hike or backpack. Whole milk or almond milk regardless? Absolutely delicious and easy to make. Definitely a keeper!